What's this? Well it looks like the new S-Series on sale in Canada at Futureshop's website. ABI member fireballz discovered this last year in late October, which is shocking since I have not seen any press releases from Sony Canada with regards to this player, or even any mention of it on the Sonystyle website. I will be contacting Sony Canada to get further information but I doubt I will receive anything since they rarely know what is going on at all with the Walkman brand. Link after the break. At a $159 bucks, it is not a bad deal, since you receive 8GB, noise cancellation and amazing headphones. If the 16GB model was to be sold as well, I would expect a price point of no more than $199 since the previous 16GB S-Series (S745) came in at this price point. 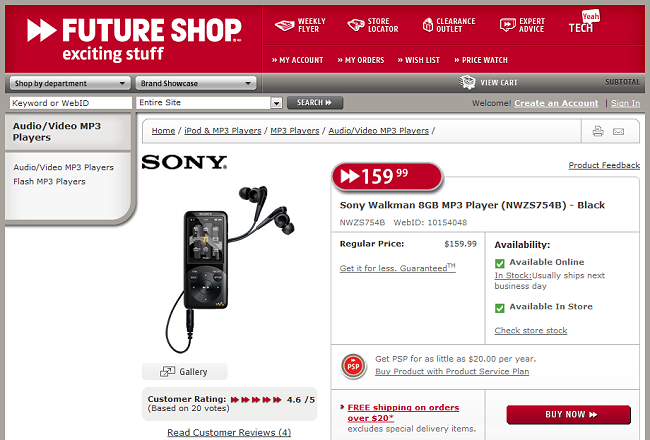 If anyone is looking for a great quality MP3 player in Canada, I would check this player out at your local Futureshop (assuming it is there) and see how it sounds. But knowing Futureshop, I would call ahead or check the availability using the website. Doing a quick check myself for Vancouver (used to live there) it appears that Coquitlam Centre has it in stock. I will keep everyone posted about any replies from Sony Canada.